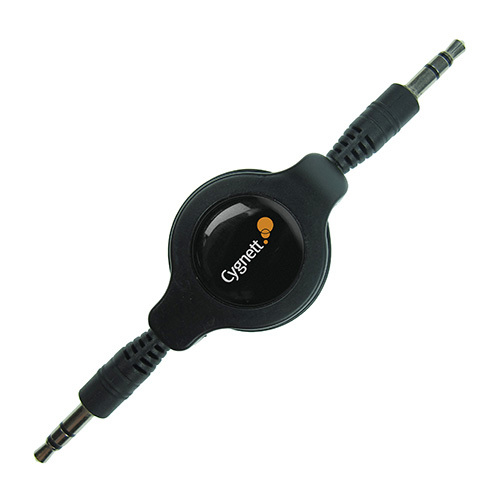 This handy little (and I do mean little) device from Cygnett is a retractable stereo cable which allows you to connect a variety of devices into speakers. Called the ZipRetractable Stereo Cable, it neatly contains a 80cm long audio cable to connect to speakers such as a stereo system, audio-in connection in a car or even a computer. The cable contains two 3.55mm jacks and by plugging one end into your device (e.g. iPhone) and the other end into the audio-in connection on your portable speakers, that's all you need to do to connect two devices. It's flawless and allows you to listen to music quickly without the need for messy cables. The good thing about the cable is that it gives the user full control to the length of it, whether it’s 10cm, 40cm or the entire length (81cm), its simple design works quite well in this aspect. To retract the cable, it simply retracts neatly back into the ZipRetractable thanks to its tangle free technology. Another impressive feature of the ZipRetractable Stereo Cable is the size which is great for transporting, whether it’s sitting in your pocket or in a laptop bag, its size does not impede you in any way. At the end of the day, the ZipRetractable Stereo Cable is quite affordability priced and if you’re looking for a clutter free and great cable management system for your MP3 players and the like, than we could happily recommend that you investigate this device. With a 2-year warranty, there are no complaints from us, recommended!